For question about any of the retreats or events with Anam Thubten, the contact information is on the calendar of events. 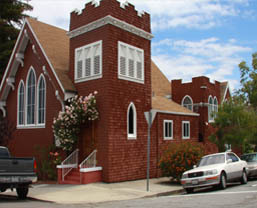 The headquarters for Dharmata Foundation and main community (Sangha) are located at the Dhyana Hall in Point Richmond, California. Point Richmond is situated on the east shore of San Francisco Bay, twenty miles from the San Francisco airport and directly across the bay from San Rafael and Marin County. The historic community, which was the commercial hub of Richmond 110 years ago, is now a quiet small town in the midst of the busy bay area. The street parking immediately surrounding the Dhyana Hall is residential. We wish to be respectful of our neighbors and request that visitors park in the nearby commercial area. It is a short and lovely walk to the Temple. From either SFO or Oakland Airport you may take BART to the El Cerrito Del Norte station. You will find directions in the airport to the BART stations. (From San Francisco, transfer at Oakland City Center/12th Street to the Richmond line). You can also find information at www.bart.gov. From the El Cerrito del Norte BART Station, catch AC Transit Bus 72M, northbound. Busses run every 30 minutes. Get off at Washington Ave. and Tewksbury Ave. in Point Richmond. Walk 3 blocks south on Washington to the Dhyana Hall at Nicholl Ave. The bus trip is about 25 minutes. Fares and schedules can be found at www.actransit.org . If you arrive by AMTRAK, you can also ride the AC Transit 72M. The trip is about 10 minutes. Note: Email is the best way to receive a timely response.